We are striving to translate Gandhiji’s ideas into reality. One step towards preserving not only the village culture but also making it self sustainable. Objective- to promote traditional and efficient natural irrigation systems and watershed management programmes so that adequate water is available for drinking and for agriculture. 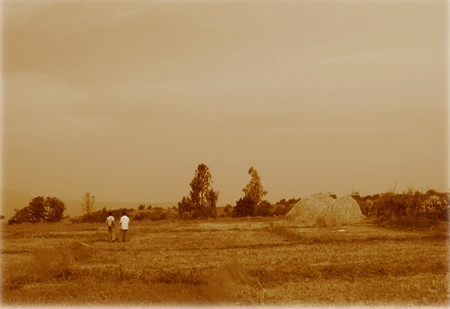 Venu-Madhuri’s constructive plans for Ramanwadi are – to work towards development of Ramanwadi and its community into a self-sufficient unit, which will serve as a model for other villages to follow. Venu-Madhuri’s emphasis will be on providing relevant education, training, know-how, inspiration, counseling and other need-based services. Thus Venu-Madhuri’s role will be that of social catalyst, stimulating and encouraging the villagers not only as beneficiaries but to be partner, in all developmental activities. Through the “people’s participation” approach, Venu-Madhuri will initiate “for-the-people, by-the-people “developmental projects. Back Ground: Village Ramanwadi (56 houses with 360 heads) comes under heavy rainfall area (Average rainfall 3818 mm, with 120 rainy days) is situated on Sahyadri ranges (Western Ghats). Ramanwadi is located off the road in isolated forest region where the basic facilities like road, health center, secondary education, market are still missing. 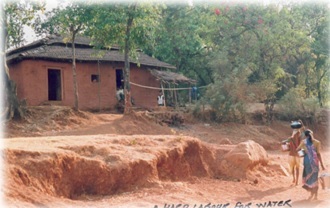 For basic requirement like matchstick or salt villagers, walk three km down and up the hill. Several cases of emergency pregnant ladies being carried through bullock cart got delivered in the cart causing fatal treat to baby and mother. Water: Ramanwadi receives an average of 4000 to 4500 mm of annual rainfall, yet the paradox at Ramanwadi and other villages was water scarcity for agriculture after November and drinking water scarcity March onwards. Economics: The water scarcity for agriculture had led villagers either to migrate to city for livelihood or work as labor on others farms at distant place or depend on forest resource. Environment: Degradation of reserve forest was rampant as that’s was only source for livelihood generation for several families. Health: 90% plus school going children were malnourished. For higher secondary education kids were forced to walk 8 to 10 km through rough terrain. Youth and elders were in strong grip of harmful addictions. Cattle: Villagers had left their cattle unattended in reserve forest because of its unproductive use. Social: Fight over water, caste and politics were extremely high at Ramanwadi leading to frequent complains at police station. Agriculture: Villagers were only able to practice monsoon farming for four months. The use of chemicals in farms had already made a way. Levels of soil erosion were noted very high. Venu Madhuri with villagers completed three projects. First one was a percolation tank on a stream in 2003, and two irrigation projects in 2004 and 2006. 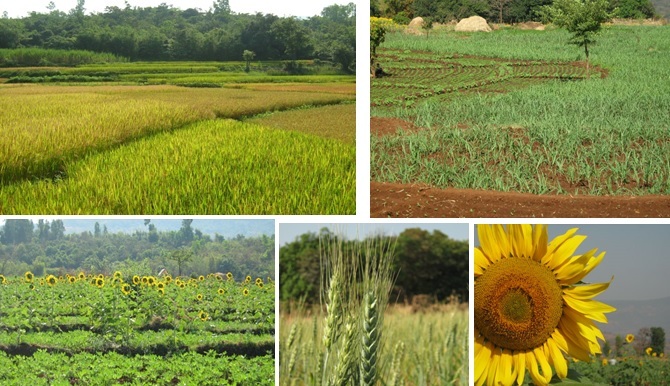 As a result of the work today Ramanwadi has 50 acres of land under perennial irrigation. The irrigation projects have benefitting 40 families. In 2004 the sugarcane production of whole Ramanwadi village was 75 tones and in 2009 the production of sugarcane was 700 tones (at Rs 2000/tone in 2009). Sugarcane cutting labor of worth Rs 80,000 is generated every year at village. With sugarcane villagers grow oilseeds, vegetables, and millets for personal consumption and surplus goes for market sale. Project-I: The first project was completed in 2004. In which a perennial stream was tapped and the water is channelized through a three inch PVC pipe of 2700 feet length. Project-II: After the success of first project, the second project was planned on the same principles and got completed in 2006. 9500 feet PVC pipeline of 4 inch diameter was laid to carry water from perennial stream. Watershed development We promote traditional and efficient natural irrigation systems and watershed management programs. Animal husbandry (With special emphasis on cattle) We help to preserve and protect by various pure, indigenous breeds of cattle, particularly ones that are currently endangered. Cottage industry We Encourage and train villagers and rural communities into development of various traditional skills, sciences, arts and craft. Culture We help preserve the distinctive cultural identity of rural communities by encouraging various traditional forms of culture-arts, crafts, music, drama and festivals. Organic farming We promote traditional principles of organic farming using animal power and simple traditional technologies. Education We impart knowledge of traditional sciences in different areas and value based character-building education to students. Health We implement proper system of hygiene and sanitation, including waste recycling. Educating and encourage rural communities to practice the art of natural, healthy living avoiding destructive addictions and habits. Maruti A. Patil and his family are from Ramanwadi Village, Radhanagari Tehsil, Kolhapur District; M.S. Venu Madhuri is working with Ramanwadi villagers since 2001, to make Ramanwadi into a village of local self-sufficiency. .
Yashvant is now 40yrs old, he left home at the age of 22 and started working as power loom operator at industrial town named Ichalkaranji. He left his family of 2 daughters and one son with wife at Ramanwadi.